This book is about the life of Ayrton Senna, the three times Formula One world champion. It is the first proper story of a man the world revered and whose like will never be seen again. In this first full account of the life of Senna, the author and his collaborators examine each detail of the driving maestro’s life – from his earliest days to his first race, his pole positions and his world championships – as well as his death and its aftermath. It is a story that has never been fully or properly told, and it is a story that needed to be told. The Life of Senna is believed to be the biggest selling third party written motor racing biography of all time. It was published first as a £25 hardback and then £9.99 softback. It has since sold 72,000 copies and continues to sell over 500 copies each month. Six years after it was first published, The Life of Senna is thought to be one of the most successful motor racing biographies of all time. 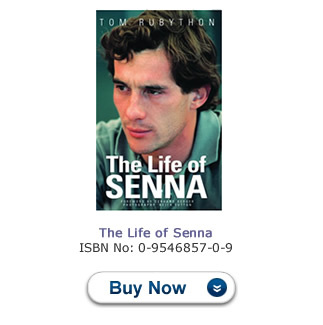 It is believed to have outsold all previous books about Ayrton Senna books combined. The hardback, published in 2004, completely sold out its 22,000 print run inside a year. The softback was published in 2006. However, the softback was published prematurely and it is believed that another 30,000 hardbacks could have been sold if they had been made available. From a print run of 60,000 copies, the softback has already sold over 50,000 copies. On Sunday 1st May 1994, Ayrton Senna was leading the San Marino Grand Prix when suddenly his car veered inexplicably off the track at Tamburello bend. His Williams-Renault crossed over both the grass and concrete run-off strips before finally impacting the concrete wall. It is thought that the front of his head hit the concrete wall, forcing his helmet back on to the headrest and crushing the back of his head. Either impact would have been enough to kill him. The greatest racing driver the world had ever seen would be declared dead just over four hours later. Senna was in many people’s opinion the most brilliant Formula One driver who ever raced. His death was as shocking as it was public. Over 200 million people watched the crash on television, and those in the know realised he was dead as soon as his car came to a rest. Tom Rubython is editor-in-chief of BusinessF1 magazine, the monthly publication for Formula One’s business community. He is the founder and former publisher of Formula 1 Magazine and ex-editor of EuroBusiness magazine. A specialist business writer and well-known Formula One columnist, he led a team of writers and researchers who spent three years investigating the 34 years of the life of Ayrton Senna. Keith Sutton began his career photographing motor racing in 1980 but got his first big break when he met Ayrton Senna in 1981. Sutton was the same age as Senna and the two men clicked. He became Senna’s first official photographer and unofficial PR man. And it was Senna who invited Sutton to his first Grand Prix in Brazil in 1984. A few years later the two men split up after Sutton formed his own agency called Sutton Motorsport Images. But they remained friends up to Senna’s death in 1994. Keith Sutton is now widely regarded as Formula One’s top photographer. Gerhard Berger started his racing career driving AlfaSuds and rose through the ranks of Formula Ford and Formula Three before joining Formula One in 1984. In 1986, he won his first Grand Prix in Mexico for Benetton. He then drove for Ferrari and McLaren and won eight races. He finished his career with the Benetton team, winning his final race at the German Grand Prix in 1996, retiring at the end of that year. He soon returned to the tracks in a non-driving capacity as BMW’s motorsport director before retiring again at the end of 2003.